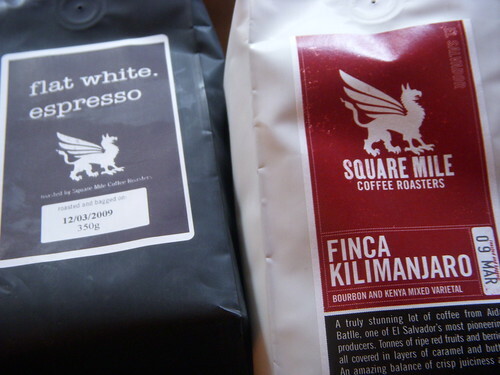 Flat White and Finca Kilimanjaro coffees, roasted by Square Mile Coffee Roasters of London. This is like part 2 of my previous post as on my visit to Flat White, Soho in London, I picked up these two bags to take home with me. I had already tried the Flat White version when I was in London in December 2008, but I was really drawn to the Finca Kilimanjaro, as I had read about this on Square Mile’s website and was really intrigued about how a Kenyan peaberry tree, planted in El Salvador, would taste- it’s called a Bourbon and Kenyan Varietal and Square Mile seem to pack their really special coffees in these nice white bags. I thought “that’s really original, taking a coffee plant from one country and planting it in another to get a really good mix of soils, air, etc… for a coffee”. Apparently, the lady who thought this up, Aida Batle, is famous for this and is one of the World’s renowned coffee growers, so who am I to question her logic. So, what does it taste like ? Fruity, spicy, earthy, sweetish and with a “real” coffee aroma is what comes to mind, or should I say to my tongue. I didn’t try this as an espresso, as I just didn’t think these type of characteristics together with the Kenyan mix would work as an espresso, so it was the French Press or Cafetiere for me, where I definitely had no regrets – a truly beautiful cup indeed. I also give it my “very versatile” coffee award in that although it was roasted on 9 March 2009, three weeks afterwards it was still tasting nice and not bland. 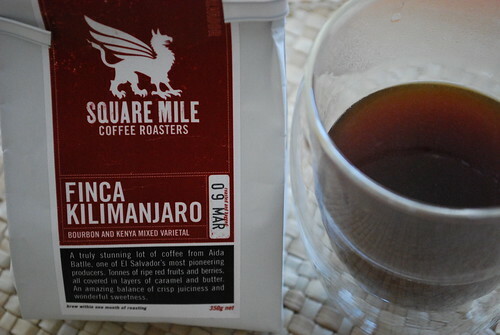 This coffee is offered for a limited period only, so log onto Square Mile’s website (their website is on my blog roll) and buy a 350g bag quick. This entry was posted on Tuesday, April 7th, 2009 at 11:01 pm	and tagged with arabica, Batle, Beans, Bourbon, coffee, El Salvador, flat white, Kenyan, london, Square Mile Coffee Roasters and posted in Bean Talk - Coffees, I'm Drinking. You can follow any responses to this entry through the RSS 2.0 feed. 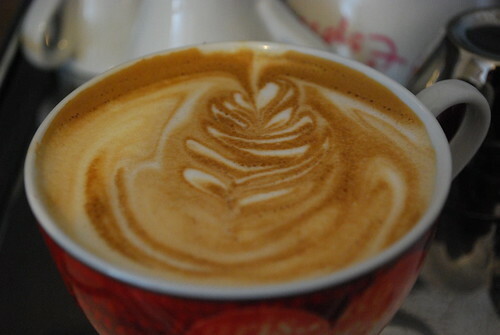 « A Day of Triple Espressos….. Hmmm !